As a part of the hiring regiment, many companies understand the necessity to create job descriptions, post them to various job boards, professional networking & social media platforms with the intention to get in front of a relevant talent pool. However, all this struggle to capture the awareness of top talent can easily go to waste when the company is not provided to manage incoming applicant interest in an established way with a suitable Applicant Tracking System (ATS). The idea behind the Applicant Tracking System is to ease the hiring process by building a better and longer relationship between the companies and professionals. Since the hiring process is a complicated one, an ideal ATS should help the hiring managers to hire faster and thus improve the quality of new hires. 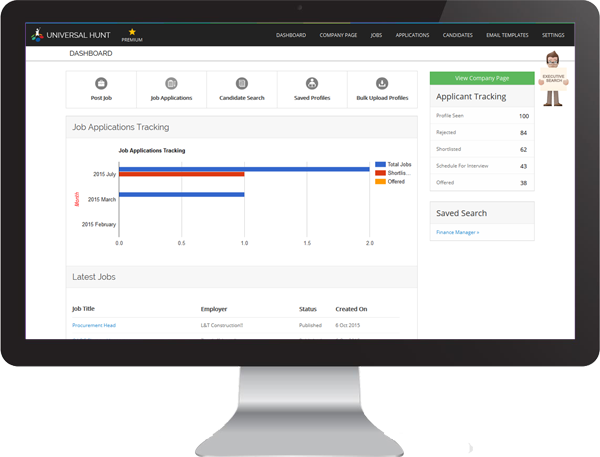 As a professional networking and career portal, Universalhunt.com gives an inbuilt Applicant Tracking System (ATS) to companies to monitor all applications by candidates right up to the joining. We share a few things for you to consider before choosing an ATS for your company. Understanding your company’s unique business requirements is essential in order to determine which systems would serve your company’s needs best. This is absolutely true in the case of selecting a good applicant tracking system for your particular needs. One of the main advantages of using tracking this system is that it allows the entire recruiting team work collaboratively on the platform. A good Applicant Tracking System should make it easy for all members in the process to access the system simply and communicate with each other as required. The best part of getting your recruiting activity organized is to be able to accomplish your applicant funnel with the capability to quickly and easily search, screen, and filter through the massive numbers of incoming applications that your company receives. We hope we made it easier for you to instantly identify the right Applicant Tracking System (ATS) for your company without going through a ton of product demos. Previous Previous post: What is Universalhunt.com?